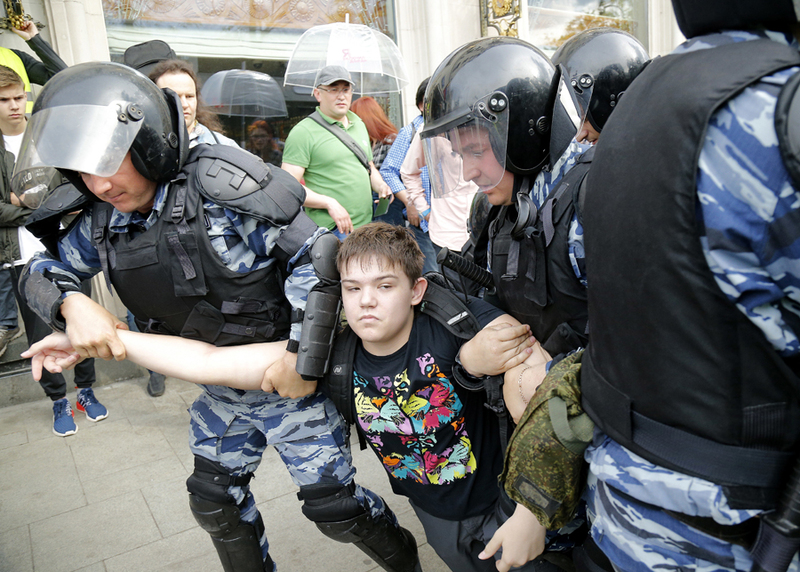 MOSCOW — Tens of thousands of protesters held anti-corruption rallies across Russia on Monday in a new show of defiance by an opposition that the Kremlin had once dismissed as ineffectual and marginalized. The Moscow protest was the most prominent in a string of more than 100 rallies in cities and towns stretching through all 11 of Russia’s time zones — from the Pacific to the European enclave of Kaliningrad — with many denouncing President Vladimir Putin. Thousands of angry demonstrators thronged to Tverskaya Street, a main avenue in the capital, chanting “Down with the czar” and singing the Russian national anthem. “The scope of the rallies was amazing, and so many people came out,” Navalny told reporters shortly before he was sentenced, point to protest rallies held in towns which have not seen any public show of discontent for decades. The demonstrators appeared to skew predominantly younger — those who were born or grew up during Putin’s 17 years in power. Similar crowds turned out on March 26, rattling officials who had perceived the younger generation as largely apolitical. School and university staff who reportedly reprimanded their students for attending the March protests warned them against going to Monday’s rally.